This book considers jurisdictional issues on violations of personality rights through the Internet under the so-called `Brussels-Lugano Regime' and centres on the special rule of jurisdiction in matters relating to tort, delict, or quasi-delict. 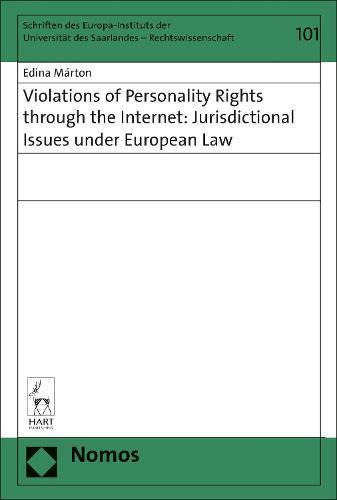 It notes the governing objectives and underlying principles of this special rule; analyses its interpretation through the judgments of the ECJ, especially Bier, Shevill, and eDate and Martinez; and explores views expressed in legal theory and national judicial practice regarding its application for localising online violations of personality rights. The book aims to examine how the eDate and Martinez approaches advance administrability, predictability, and litigational justice and to assess whether they are suitable jurisdictional bases in Europe, where common legal norms, interests, and values increasingly integrate and connect persons. It concludes that they are not and recommends their possible reform.